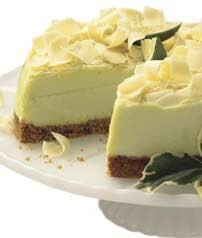 Key Lime, White Chocolate and Graham Crackers....YUM! Our Key Lime silk is our #1 seller and has remained so for 30 years now thanks to Neiman Marcus. It has been featured in their Holiday books and online now for the past 29 years and is again one of the holiday desserts. A graham cracker crust that has been created in our gluten room because our bakery is now a dedicated gluten free bakery. The original key lime white chocolate silk is placed on top of the graham cracker crust and the Key Lime is topped with our white chocolate shavings.